Brilliantly green coastline reveals tree-house villas perched on a jungled hillside. Lounge by your plunge pool, then stroll to the powder-sand beach, one of the best on the island. Revel in days of barefoot ease, serenaded by tropical birdsong and scented by cinnamon trees and frangipani. Recharge the spirit with storybook adventure, exploring jungle and sea. With refreshing warmth and devoted attention, Four Seasons awakens the joy of fresh discovery. 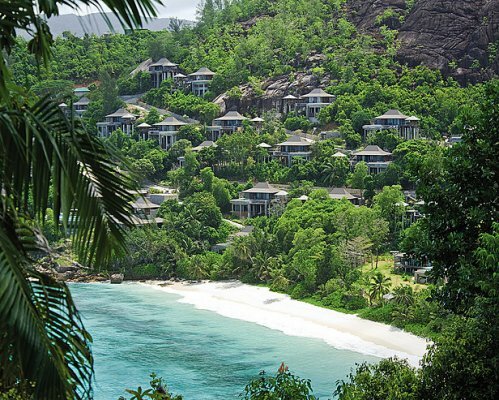 The 67 villas and suites of Four Seasons Resort Seychelles reflect the symphony of contrasts that characterises the island’s natural surroundings. These expansive accommodations are grounded in traditional Creole design featuring natural timber and brick, with views that soar above rocky granite outcroppings to the azure waters of the Indian Ocean or the island’s verdant landscape. All villas and suites feature expansive outdoor spaces that open up to a lush tropical oasis, where coconut, mango, jackfruit and cinnamon trees kiss the air with a heady fragrance. Located at the top of the hill, with spectacular views of Petite Anse and the entire Resort, the Spa is designed with a focus on solitude and seclusion. Five individual spa pavilions offer beautiful views of the Indian Ocean. A 54-square-metre (580-square-foot) yoga pavilion is connected to the Spa entrance by a timber deck. The space is available from sunrise to sunset for private instruction or individual yoga sessions. Yoga mats, straps, blocks, towels and water are provided. The Spa is a safe haven that reconnects guests with nature and offers an in-depth holistic experience. Featuring treatments that are indigenous to Seychelles, the Spa incorporates fusion techniques from India and other Asian traditions. You will be picked up at your villa and taken to the Spa in a buggy. Upon arrival, your journey of wellness will begin with a personal consultation and assessment. Before experiencing one of our specialty treatments or rituals, you will be invited to have your constitution analysed, focusing on energy flow and the interplay of the five elements, which are strongly related to physical and emotional balance. The Spa’s treatments incorporate local herbs and spices and follow ancient recipes. Massages, body scrubs and wraps, facials and foot and hand treatments are offered in harmony with island traditions. Spa rituals incorporate herbal tonics and organic teas from the island. Yoga and meditation activities balance energy centres to bring harmony and peace. The Fitness Centre offers a selection of state-of-the-art Technogym equipment, each machine with its own television and headset for private entertainment. Complimentary exercise wear is offered, including shorts, shirts, gym shoes and socks. Personal training with certified trainers is available by reservation. The Fitness Centre is open to guests 13 years of age and older. The 517-square-metre (5,565-square-foot) pool is located just a few steps from the beach. Guests can relax on one of the chaises longues and enjoy poolside dining and refreshments. Joggers looking for a moderate course can take advantage of the Resort’s jogging trail around the lagoon and through the garden at the foothills of the mountain backdrop surrounding Petite Anse. An advanced trail, more suitable for a comfortably paced walk, offers steep elevation changes and some of the most impressive views of the Resort. The routes range from 3 to 6 kilometres (2 to 4 miles). The Library is set in its own 56-square-metre (600-square-foot) pavilion, where guests can lounge with a collection of contemporary books and magazines, including guidebooks about Seychelles and Creole culture. A flat-screen television is available, along with complimentary high-speed Internet access at two workstations with desktop personal computers and colour-printing access. A wide selection of complimentary DVDs, CDs and books is available for guests to enjoy in the Library or borrow to use in their villa. The Library is available to guests 24 hours a day, seven days a week. Please contact the Concierge if you wish to access the Library between the hours of 11:00 pm and 7:00 am. Whether yours is just beginning, all grown-up or at any stage in between, Four Seasons Resort Seychelles is a wonderful base for your family. We go out of our way to make our youngest guests feel welcome, and our resourceful Concierge is always close at hand – to make reservations for a family dinner, offer suggestions for tomorrow’s outing or help arrange a babysitter. With 24 hours notice, we can arrange reliable babysitting services for your little ones. We will do anything possible to accommodate requests with shorter notice. Please note that there is an hourly fee for this service. For more information, please contact the Concierge. Our Concierge would be pleased to suggest and help you arrange suitable activities for your family’s ages and interests. Romance blossoms naturally in this lush castaway sanctuary that some claim was the original Garden of Eden. Plan your wedding ceremony amidst cinnamon trees and frangipani, or on the peaceful powder-sand beach – considered one of the island’s best. Linger over a celebratory dinner as the sun dips into the Indian Ocean. Then hide away in your tree-house villa with infinity-edge plunge pool and open-air shower. Share the joy of fresh discovery together. Make your event truly unforgettable in a lush castaway sanctuary – with tree-house villas laced across the hillside of a powder-sand cove. Revel in days of barefoot ease, lounging together by your plunge pool, discovering yoga or spa. Share thrilling storybook adventures, exploring jungle and sea. With refreshing warmth and devoted attention, Four Seasons enriches your occasion with the joy of fresh discovery. Bring unrivalled focus to your business gathering in this lush castaway sanctuary. Meet in high-tech convenience, and host receptions amidst botanical gardens or on the powder-sand beach. Revel in barefoot ease, lounging in your tree-house villa with private plunge pool. Then share thrilling storybook adventures, exploring jungle and sea. With refreshing warmth and devoted attention, Four Seasons enriches your event with the joy of fresh discovery. Set above the island’s granite terrain, Hilltop Ocean-View Villas exude all the comfort and charm of a private home. From high above Petite Anse bay, the villas feature unforgettable panoramic views of the turquoise and blue waters of the bay and the surrounding mountains. An expansive hardwood deck sets the stage for each villa’s stunning 115 square metres (1,238 square feet) of outdoor space, which includes a covered daybed and chaises longues, poolside dining for three, and a 28-square-metre (302-square-foot) private plunge pool. The bedroom offers a 107-centimetre (42-inch) flat screen television, multimedia, wireless Internet access and other amenities. The bathroom has a spacious walk-in closet, a marble-tiled deep soaking tub, a WC and bidet in a separate alcove, and a private outdoor shower. *Décor:Colours and textiles reflect a harmonious blend of contemporary and traditional aesthetics, highlighting the island’s unique cultural mix. Set above the island’s granite terrain, Ocean-View Villas exude all the comfort and charm of a private home. A short walk from the shoreline, the villas feature beautiful views of the Indian Ocean. The bathroom has a spacious walk-in closet, a marble-tiled deep soaking tub, a walk-in shower with rainforest showerhead, a WC and bidet in a separate alcove, and a private outdoor shower. *Décor:	Colours and textiles reflect a harmonious blend of contemporary and traditional aesthetics, highlighting the island’s unique cultural mix. Set above the island’s granite terrain, Garden-View Villas exude all the comfort and charm of a private home. The most suitable choice for families with children, these villas are just steps from the shoreline and feature stunning views of the island’s lush tropical surroundings. Set on the island’s granite landscape, the Three-Bedroom Royal Suite enjoys premier views of the Indian Ocean, just steps from the shoreline. 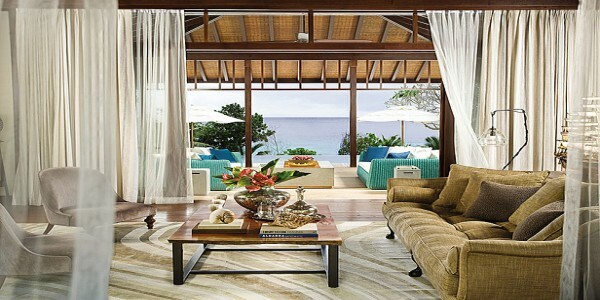 The suite comprises four pavilions, with bedrooms distinct from living space for added privacy. The Three-Bedroom Royal Suite includes complimentary poolside afternoon cocktails and butler service upon request, as well as breakfast through In-Villa Dining. This suite offers 524 square metres (5,640-square-feet) of outdoor living space, including an expansive uncovered sundeck furnished with chaises longues for six guests, and a private 113-square-metre (1,216-square-foot) pool and whirlpool. A two-storey pavilion houses a living area with double sofabed, dining area for six guests and service quarters that include a pantry and separate entrance. Bedrooms, each with their own ensuite bathroom, are secluded in individual pavilions and connected via the exterior deck; each bedroom features a 107-centimetre (42-inch) flat screen television, multimedia, wireless Internet access and other amenities. Each bathroom offers a spacious walk-in closet, a marble-tiled deep soaking tub, a walk-in shower with a rainforest showerhead, a WC and bidet in a separate alcove, and a private outdoor shower; the master bathroom features a flat screen television. Set on the island’s granite landscape, the Two-Bedroom Presidential Suite enjoys premier views of the Indian Ocean, just steps from the shoreline. The suite comprises three pavilions, with bedrooms distinct from living space for added privacy. The Two-Bedroom Presidential Suite includes complimentary poolside afternoon cocktails and butler service upon request, as well as breakfast through In-Villa Dining. This suite offers 478 square metres (5,145 square feet) of outdoor living space, including water features, an expansive uncovered sundeck furnished with chaises longues for four guests, and a private 79-square-metre (850-square-foot) pool and whirlpool. A two-storey pavilion houses a living area with double sofabed, a dining area for eight guests and service quarters that include a pantry and separate entrance. Each bathroom offers a spacious walk-in closet, a marble-tiled deep soaking tub, a walk-in shower with a rainforest showerhead, a WC and bidet in a separate alcove, and a private outdoor shower. From high above Petite Anse bay, set on the island’s granite landscape, Two-Bedroom Hilltop Ocean-View Suites enjoy unforgettable panoramic views of the turquoise and blue waters of the bay and the surrounding mountains. The suites comprise three pavilions, with bedrooms distinct from living space for added privacy. These suites offer 313 square metres (3,370 square feet) of outdoor living space, including an expansive uncovered sundeck furnished with chaises longues for four guests and a private 78-square-metre (840-square-foot) pool and whirlpool. A separate two-storey pavilion houses interior living space, a dining area to accommodate six guests and a pantry with a separate service entrance. The Two-Bedroom Hilltop Ocean-View Suite includes complimentary poolside afternoon cocktails and butler service upon request. Set on the island’s granite landscape, the Two-Bedroom Ocean-View Suite offers panoramic views of the Indian Ocean, a short walk from the shoreline. The suite comprises three pavilions, with bedrooms distinct from living space for added privacy. This suite offers 313 square metres (3,370 square feet) of outdoor living space, including an expansive uncovered sundeck furnished with chaises longues for four guests and a private 78-square-metre (840-square-foot) pool and whirlpool. The Two-Bedroom Ocean-View Suite includes complimentary poolside afternoon cocktails and butler service upon request. Inviting outdoor living space, including covered and uncovered decks, is furnished with comfortable chaises longues. A balcony extends from every bedroom. The indoor living area features a formal dining area with seating for 10, a den with a home entertainment system and a separate study. A fully equipped gourmet kitchen is complemented by a separate laundry room and butler’s quarters. All rooms are fitted with wireless Internet connections, flat-screen LCD televisions and dual-line telephones. Each bedroom offers a king-size bed and walk-in closets with in-room safes. Four hugely spacious ensuite bathrooms include a double vanity, sunken bath, glass-walled indoor rain shower and an outdoor shower; a fifth ensuite bathroom includes a vanity and shower. The indoor living area features a formal dining area with seating for 10, a den with a home entertainment system, and a separate study. Each bedroom offers a king-sized bed and walk-in closets with in-room safes. Four hugely spacious ensuite bathrooms include a double vanity, sunken bath, glass-walled indoor rain shower and an outdoor shower. A guest powder room with shower is located off the outdoor living area. Inviting outdoor living space, including covered and uncovered decks, is furnished with comfortable chaises longues. The indoor living area features a dining area for 10, a den with a home entertainment system and a separate study. All rooms are fitted with wireless Internet connections, LCD televisions and dual-line telephones. Two master bedrooms feature a king bed and walk-in closets with in-room safes. The twin bedroom includes a large wardrobe. Each master bedroom features a hugely spacious bathroom with double vanity, sunken bath, glass-walled indoor rain shower and outdoor shower. A bathroom off the twin bedroom includes a rain shower and double vanity, and a guest powder room with shower is located off the outdoor living area. Diverse flavours capture the cultural mix of the Seychelles – encompassing Creole specialties and tastes from the Mediterranean and Southeast Asia. Four Seasons dining and cocktails are offered at two restaurants and two lounges, set hillside and beachside. Boasting spectacular ocean and sunset views from the top of the hillside, ZEZ is the perfect place to dine. A breakfast buffet offers Continental and Arabic dishes, while a full American breakfast and some speciality dishes are available à la carte. For dinner, Mediterranean specialities include Middle Eastern dishes. The restaurant’s open-air design takes full advantage of Seychelles’ warm, sunny weather. A children’s menu is available. A children’s menu is available and includes a selection of pizzas. Infused with a warm and refined elegance, ZEZ Lounge is the perfect spot to enjoy sushi and sashimi, pre-dinner cocktails or after-dinner drinks. The restaurant’s atmosphere is enhanced by its views of the ocean. Choose from a wide selection of wines and cigars. Shesha, a traditional Middle Eastern water pipe, is also offered. Located next to the pool and close to the beach, the casual indoor-outdoor setting of Kannel Bar makes it the perfect spot to relax and enjoy light snacks, lunch and refreshing fruit drinks and cocktails. Four Seasons In-Villa Dining is a fine-dining experience within the comfort and convenience of your villa or suite. Choose from an extensive menu – day or night – that is ideal for time-zone-hopping travellers, impromptu meetings or quiet, private dining. In-Villa Dining features international and Middle Eastern cuisine. Vegetarian diets, special requests and specific dietary needs can also be accommodated. Outside catering, such as picnic baskets for island hoppers or romantic dinners under the stars, is available on request. Children’s menu available. From 11:00 am to 11:00 pm, In-Villa Dining offers the menus from all of the Resort’s dining outlets.